I never thought I’d see the day where bureaucracy gave way to music. Or perhaps it’s my middle-class angst that has finally found its ideal outlet. Regardless, whatever hurts your soul, thanks to artists Tellervo Kalleinen and Oliver Kochta-Kalleinen, it’s goodbye (Swedish) Ombudsman, hello (Finnish) “Valituskuoro”. 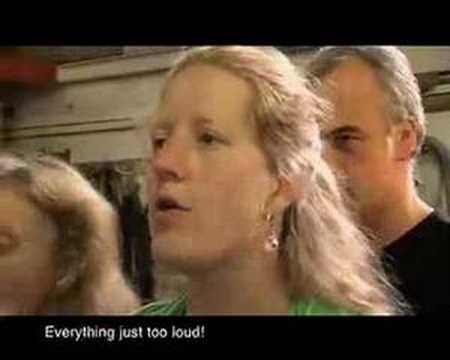 Valituskuoro – literally “Complaints Choir” in Finnish – is a figure of speech that describes humanity’s tendency to complain en masse (or, in gaggles, packs, herds… pick your favorite species). Originally meant an ironic statement on this nasty habit we have of complaining endlessly, the Kalleinens’ genius was simply to take the Valituskuoro notion quite literally. As complaining is a universal phenomenon the project could be organized in any city around the world. Kalleinen and Kochta-Kalleinen offered the concept to different events where they were invited as artists – but it was only after Springhill Institute in Birmingham got excited about the idea that the First Complaints Choir became a reality. As of late January 2007, six choirs have made their acte de présence on behalf of the project, from six different cities: Birmingham, Helsinki, Hamburg, St-Petersburg, Poikkilaakso, and Bodø. Though I like all of them on the basis of the unique voices and local colors heard in each choir, I’ve selected the Hamburg Choir here for your listening pleasure, simply because I find the tune so catchy (if not downright uplifting at times). So beyond the harmonized complaining, what’s the Zeitgeist we’re hearing? Recall that the Cluetrain people insist that the internet – and blogging especially – have brought about a sea change in culture by putting the individual human voice back at the center of communications processes. So in a sense, what blogging does to mass media, Complaints Choirs can also do… to civic life. I’ve come to this conclusion simply by listening to the choirs on the complaintschoir.org site. Indeed, the real pleasure for me has been in listening to all the choirs. The original idea has already obtained unique derivatives. 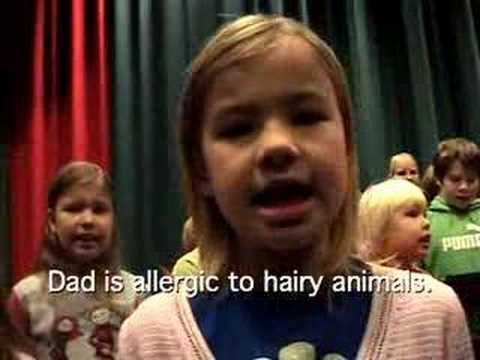 Watch this clip, the world’s first children’s Complaints Choir, put together by a teacher who participated in the original Helsinki Complaints Choir. The voices we hear are real, not merely archetypal. the music is grounded in the lives of real people, a major step away from the nostalgia industry of choral music masterpieces. The underlying emotional denominator is, of course: human misery. From the pettiest to the most soul-destroying instances. But in sharp contrast to the lowest-common denominator approach of the pop music industry, we hear in the choirs a variety of ordinary voices, in all their color and individuality. This project truly respects individual members, by ensuring each voice is heard. Beyond this, the choral pieces are a collaborative creation, given that much of their content is generated from public input. The complaints are as much local, personal, as they are global in scope and commentary. It’s that colorful gamut of issues, heard through this singing, that empower and energize both the singers and their audience. The Complaints Choir project is an attempt to bring music into daily experience, making it relevant, spiritually useful. The overall message I get from listening to each different choir is: you are not alone. Indeed, the success of the project clearly proves that misery loves company ;-). In this way, the complaining choir project has shed some light into my own attitudes about complaining. Put in the context of a group song, complaining appears to be many things, not just the whining wheedle of the quietly desperate, living their misery out in isolation. Rather we find here a chockful of insight, small-mindedness, fatigue, expressions of injustice, powerlessness, etc. from the individual voices heard through the multitude, both in solo and unison. In conclusion, perhaps it’s the voice of the complainant – that whine – which has until now made complaining so much worth complaining about. It seems that the choir approach, therefore, can be quite effective in culling the voice of human experience by literally taking the whine out of complaining. So whether you prefer to whistle in unison with brethren wage-slaves, or simply hum along to the tune of urban malaise, I’ll submit that the Complaints Choir phenomenon is for all of us every(wo)men. For the same reason the blues is still with us today: it’s an important record of human experience, putting the (suffering) human voice back on center stage, simply so it can be better heard. Yes, the Ombudsman is out of work. I’m sure he’ll get a swell government severance package, anyways. Next stop for today’s politically disillusioned new citizen… politicopia. Great post. Yes, a genre indubitably more heartfelt and palatable than ‘Let’s Give Peace a Chance’ by MTV Legionnaires. On that spiritual note, offers a wholesome solemnity a la Gregorian plainchant.